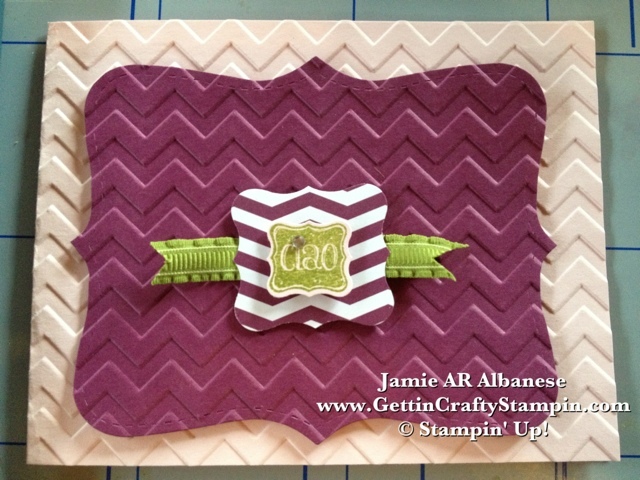 Getting Crafty with Jamie: Chevron Fun! Patterns are ALL the Rage! The Chevron Pattern is one of the most popular! Here with the new Chevron Embossing Folder and Big Shot, the Chevron Patterned FREE Sycamore Street Designer Series Paper from the Sale~A~Bration mini - the theme mimics the pattern and the punched images mimic it's self - little Mini Me's! With the Petite Curly Label Punch (from the Spring Mini and Sale~A~Bration Mini) fits the new stamp sets - Pretty Petites (Sale~A~Bration mini) and Ciao, Baby! stamp set (Spring mini) and being that I'm married to an Italian man.. I grabbed the Ciao stamp for the center of this card. 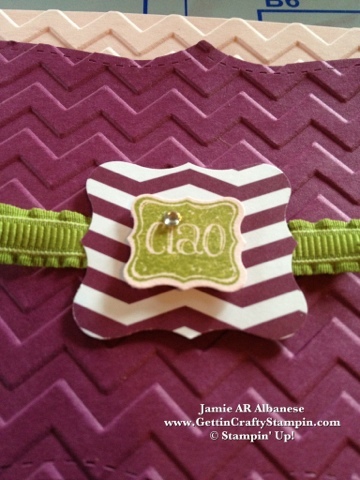 Here Lucky Limeade stamped Ciao on Pink Pirouette card stock. Building up the same image but larger, the Curly Label punch punched out the Chevron Designer Series Paper and the Top Note Bigz die cut mimics the shape as the smaller punches with the Rich Razzleberry card stock. A Dash of Lucky Limeade Ruffled Ribbon ties in a little more of the green with out overwhelming the card. 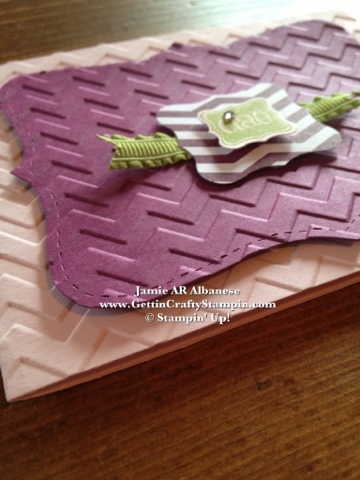 The Big Shot easily embosses the Chevron Texture, laying it over the other pattern is a fun way to keep up the theme. The Stampin' Dimensional Adhesive raises each layer and allows them to grab the textured and embossed papers. Ciao is a Hello and Good-Bye in Italian. So add a dash of sparkle as you send some love with a Hello and Good-Bye in this ultimate in greeting card! The Basic Jewels sheet of Rhinestones is ideal for this! Have FUN wit the Die Cutting tools, Punches and stamps - it's great how they all tie in to one another and make creating stunning cards. See how images mimic one another, from punches to papers, stamps and more... it's endless the fun one can have with paper crafting! Thanks the the LNS (Late Night Stampers) Color Challenge this week..
it was a fun way to combo some colors outside of the Color Coach. I may not be a lover of green girl but this color combo of Rich Razzleberry, Pink Pirouette and Lucky Limeade sure made my day (and this fun card - lol). 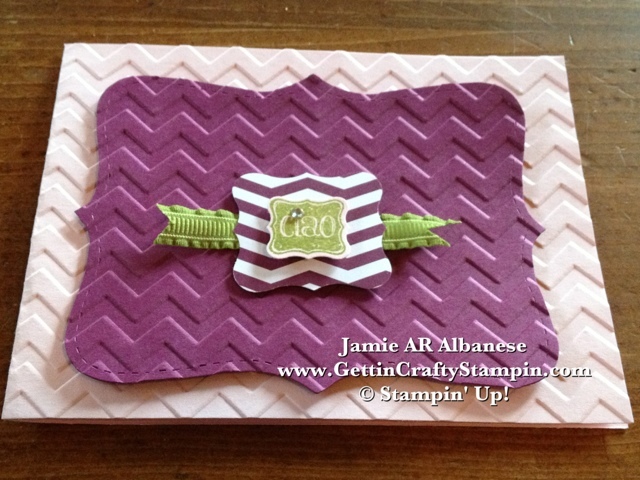 Thanks to the Chevron theme and curly label punches - this look is a fun way to mimic pattern, shape and style! Mini Me - how easy to look so trendy! Chevron, Polka Dots, Plaid, Stripes, Lace... it's limitless! Grab YOUR Favorite pattern - see our embossing folders, dies, stamps, punches and papers - pick out your style and have FUN creating with it! Then, let me know/leave me a comment, about what YOU have done! So fun! Great design, love that you kept the chevron going on both layers. 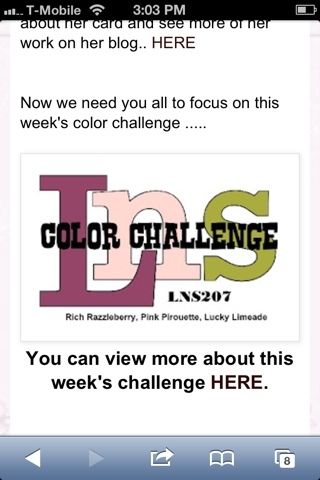 Thanks so much for playing along this week with on the LNS challenge blog! Wow, do love those Chevrons, and how you used the colors for the challenge. Thanks for sharing your talent with the LNS group this week, and hope you join us again. You are on fire Jaime! Love your cards and thanks for playing with us at LNS! 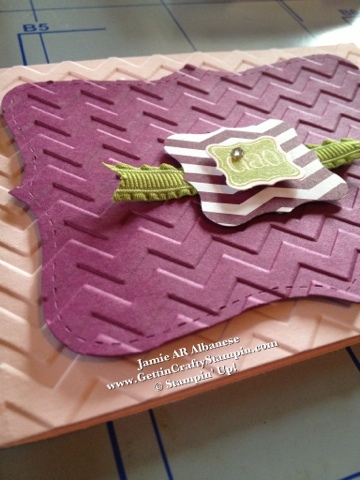 Love how you used the Chevron EF with the different colors in the challenge. Great card - thanks for playing this week!! I love the card, I seem to use the Chevron folder a lot :) Thanks for joining the LNS challenge!